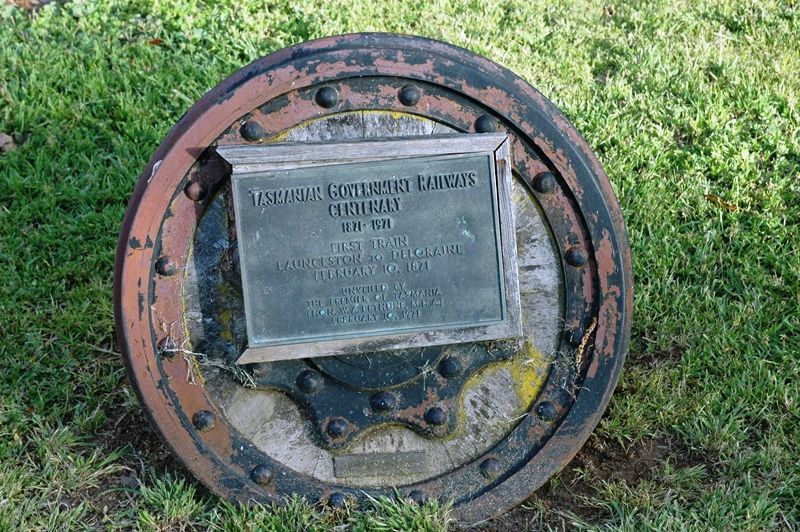 A plaque commemorates the centenary of the Tasmanian Government Railways (TGR) from 1871 to 1971. From February 7 to February 14, 1971, the TGR celebrated its centenary of operations, with special trains scheduled during this time for trips between Launceston and Deloraine with intermediate stops. Special fares were arranged for these trips, with return tickets between the two termini priced at $1.00 (approximately $9.74 in 2012). Trains were arranged with either single, double or triple-headed steam locomotives, depending on the type of stock and number of passengers carried. On February 10, the official ceremony was held at Launceston Railway Station, with addresses from the Transport Commissioner Mr. G.T Webb and Minister for Transport the Hon. L.H Bessell MHA, as well as the unveiling of a commemorative plaque by the then Premier of Tasmania, William Angus Bethune. Richard Green, the Mayor of Launceston, also presented the Guard of the centenary train with "Scrolls of Greetings", which were presented to the Wardens of the Municipalities of Evandale, Longford, Westbury and Deloraine. The Centenary Train also conveyed special mail from the Launceston Post Office, as well as politicians and invited guests.